As it stands in the Great Lakes region, approaches to governance are bolstered by Indigenous models of commons, and powerful legal traditions held in the public trust doctrine and regional treaty rights that instil commons-based governance into common law. The commons is a model of governance which sees water as being cared for through shared benefit and responsibility, sustainable use, and participatory decision-making by all those who have a stake in its health and protection. In its successful iteration, commons-based water governance relies on human being’s recognizing not only their rights to safe and clean water, but also their responsibilities to protect it. However, it has become clear that current legal mechanisms are often not enough to compel people to fulfill their responsibilities to water in the form of stewardship and protection. This blog post will provide examples from around the world where Indigenous people and allies are utilizing other, more compelling, rights-based legal mechanisms to protect the bodies of water they rely on. This blog will outline three distinct approaches to rights-based protection for water and show why the current ‘rights to water’ framework (which is the foundation of water protection in the Great Lakes region) may not be enough to protect our most vital source of fresh water. Ultimately, we will see that a rights-based approach to water protection lacks strength without the necessary accompanying urgent sense of responsibility by the human communities which rely on it. Within a rights-based framework of water protection, there are three distinct categories to consider. Rights for water – refers to the right for water to be protected, conserved, maintained and restored because of what it provides for human life. This approach to water protection is based on an argument of rationalism where water is protected for what it provides to humans. Rights of water – refers to the “rights of nature” argument. This approach to water protection is based on an argument of existentialism where the water is given its own legal personality and the same rights, duties and liabilities as human persons. While these legal mechanisms can all together be described as rights-based, there are many distinctions to be made between them, which are best described through the following case studies. The ‘rights to water’ approach to water protection might be the most familiar to those of us concerned with the Great Lakes region. This approach is based on the recognition of a human right to clean, safe drinking water. The Great Lakes hold approximately 84% of the available fresh water in North America, which makes up about 21% of fresh water on the surface of the planet. Therefore, the protection of the Great Lakes has always been a point of emphasis for Canadian environmentalists and activist groups and since humans depend on fresh water for survival, campaigns to protect this precious resource have oftentimes revolved around holding governments accountable to uphold the human right to clean and safe water. For example, the Blue Dot campaign, a project of the David Suzuki Foundation, has been organizing to hold the Canadian government accountable to legally recognize, within the Charter of Rights and Freedoms, the human right to a clean and healthy environment, which includes, but is not limited to, clean and healthy water. Through the Blue Dot Campaign, Canada is looking to join more than 110 other nations that recognize the human right to live in a healthy environment, and to enjoy clean and healthy drinking water. Campaigns such as the Blue Dot Campaign take advantage of the responsibility that governments already hold to enforce and protect human rights. However, the limitations of these campaigns stem from the fact that they can only be as effective as the governments they rely on. The rights to water approach to water protection may be the most common form of the rights-based approach to water protection however in various contexts, in Canada and around the world, environmentalists and activist groups have found the approach to lack legal strength and have since learned from the strengths and weaknesses of these campaigns. As such, the ‘rights to water’ approach to water protection represents the base floor, or foundation, for a movement toward further recognizing ‘rights for water’ and ‘rights of water’. The court makes it clear that the river has rights, however, the rights referred to in the ruling are not ascribed directly to the river, nor to the communities that rely on it. Instead, the ruling welcomes a new, somewhat symbolic, framework of rights, which is referred to as “biocultural rights”. Ximena Gonzalez, a lawyer working with Tierra Digna, one of the main Colombian NGOs championing the legal case, agrees that, the ruling is “a symbolic ruling”. Gonzalez agrees that it represents a huge win for environmental conservation in the country, since “the direct and narrow relation between biodiversity and culture is pointed out” however, the biocultural rights which are recognized in the ruling will be challenging to uphold, as they are not ascribed directly to any particular being, cultural nor environmental. Whereas a ‘rights to water’ approach recognizes only the significance of water to the human cultures which rely on it, this ruling goes one step further to recognize that rights-based language can be used for the protection of water and the biodiversity of its ecosystems. However, according to Nick Mount, this ‘rights for water’ approach to water protection “places a significant burden on the [state] to ensure the rights are enforced – and it demands that local people are empowered to manage their river properly” In contexts such as Colombia, as well as Canada, New Zealand and more, where local groups, primarily Indigenous groups, are experiencing forms of physical and structural violence imposed by the state, it becomes particularly challenging to keep the state accountable to their responsibility to uphold rights for water. This final example of a rights-based approach to water protection is arguably the most well-known globally. This ruling, which recognizes the Whanganui River as a legal entity equal to that of a person, has inspired a similar ruling in India and has since sparked similar conversations in many other contexts around the globe. On the spectrum of rights-based approaches to water-protection outlined in this blog, the New Zealand example is perhaps the most legally and intellectually compelling though it is not without its own challenges. Recognizing the Whanganui Iwi worldview, the New Zealand government enacted trailblazing legislation which attributes to the river the same rights and responsibilities as a living person. The Te Awa Tupua Act declares the river an indivisible and living whole, from the mountains to the sea, holding “the rights, powers, duties and liabilities of a legal person”. Each of the above case studies utilize rights – ascribed to humans, or ecosystems – to afford protection to water. These case studies are intellectually intriguing and compel us to think further of what it means to recognize the ‘rights (of humans) to water’, ‘the right for water’ and the ‘right of water’. However, even given the case study examples described above, the practicability of these options for the protection of water is still yet to be seen. As Nick Mount says, “awarding environmental [or human] rights is not the same as realizing them”. He says, “such rights don’t exist within a vacuum, of course, and they will only be fulfilled if political, socio-economic and cultural systems support them”. This is a common adage used to describe the give-and-take balance necessary to maintain order in modern democratic society. For example, with the civic right to vote, comes the civic responsibility to utilize that vote to elect democratic representatives. As illustrated in the below graphic, rights and responsibilities must be equally upheld, protected and enforced, as if they exist on opposite sides of a scale. In practice, rights and responsibilities do not exist opposite one another; each legal person ascribed rights must carry-out responsibilities in conjunction with these rights. So, in practice: Once given rights, how is the Whanganui river, and other rivers or ecosystems similarly ascribed legal personhood, supposed to uphold the responsibilities, duties and liabilities, that come with these rights? The New Zealand settlement court answered this question by creating Te Pu Tupua, a two-person governing body to act as the human face of the river. This body, designed to “advise and support Te Awa Tupua in the exercise of its functions”, is made up of one representative nominated by the Whanganui Iwi, a Maori tribe known to be of the river, and one representative from the Crown. The ‘functions’ of the river as described in the settlement include the rivers rights, as well as duties, responsibilities and liabilities of the river as a legal person. The Te Pu Tupua is responsible for protecting the rights of the river. They are also responsible for carrying-out the responsibilities and duties of the river. With rights, the river also has responsibilities. 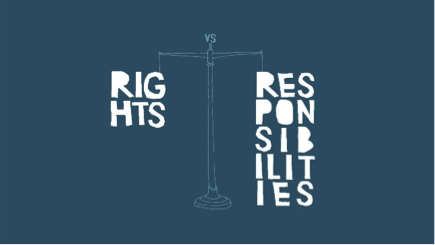 If rights and responsibilities are enacted only in conjunction with one another, what is the difference between the two? As described in a previous blog, “one of the biggest differences…is where they source their legitimacy. Rights come from States whereas responsibilities come from relationships.” Each of the cases described above seeks to utilize the legitimacy of Western legal rights to afford protection to water. However, what if the frame was flipped? What if cases such as those described above sought the protection of water through recognizing humans’ responsibilities to it first and foremost, rather than realizing their responsibilities to water only in relation to rights? As we consider the Great Lakes and acknowledge that a transformation of our relationship with water is necessary for its sustained protection, we should consider a responsibility-based approach to water protection. If we consider, first and foremost, our responsibilities as humans to the waters we rely on then conversations of our ‘rights to water’, ‘rights for water’ and the ‘rights of water’ will be much easier understood and the legal relationships necessary to uphold them will be strengthened. This sentiment has been laid out by Sto:lo/Metis writer and teacher Lee Maracle when speaking at a Downstream gathering, Lee used the word “obligation” to explain how responsibility is different than rights. The book Downstream is a collection of writings and stories which aim to help readers reimagine their relationships with water. She says, when outlining her own relationship to water, “I do not have rights, I have obligations”. The concept of obligation to water which Lee relies on is a notion grounded in Indigenous legal traditions, as outlined in Downstream. Before settlers arrived, Indigenous nations were guided by protocols and laws which were specific to each nation and linked to the land and waters on which they lived, as well as the relationships which they had with the land, water and its creatures. In response to the campaigns for the rights-based protection of water, whether it be rights to water, rights for water or rights of water, Lee suggests that we instead talk about our obligations to water, as a form of responsibility based on the relationships we have with the land, water and its creatures. As written in Downstream, our obligations should be grounded in relationships that are affirmed by legal traditions, rather than founded entirely by legal traditions. In other words, our responsibility is not to uphold legal traditions, such as rights-based protections of water, but instead to uphold the relationships we have with water, and with each other, which have existed long prior to legal movements toward recognizing rights to, for and of water. Madison Laurin is a settler-Canadian; having grown up in Southern Alberta with a family of British, French, Hungarian and German descent, she moved to Toronto for her studies. As a transplant to Ontario, Madison is passionate about learning about the people and stories of this territory. Throughout her studies, Madison had been involved in research and advocacy work with indigenous groups in North and Central America; from Alberta to Hawai’i, Guatemala, Panama and Belize. As a recent graduate she is excited to continue this work of learning from and connecting with communities in Nogojiwanong/Peterborough and surrounding area while working with TRACKS.